The flooding is linked to two hydropower projects on the Madeira River in the western state of Rondônia. 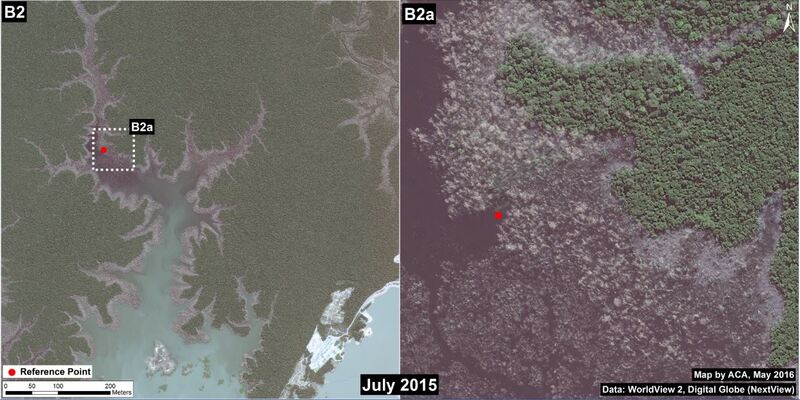 Much of the flooding occurred in primary rainforest that was once part of a national park. The deforestation has released millions of tons carbon dioxide. Biologists say that the dams could be harming species of catfish that migrate long distances to breeding grounds, as well as changing nutrient flows in the river. 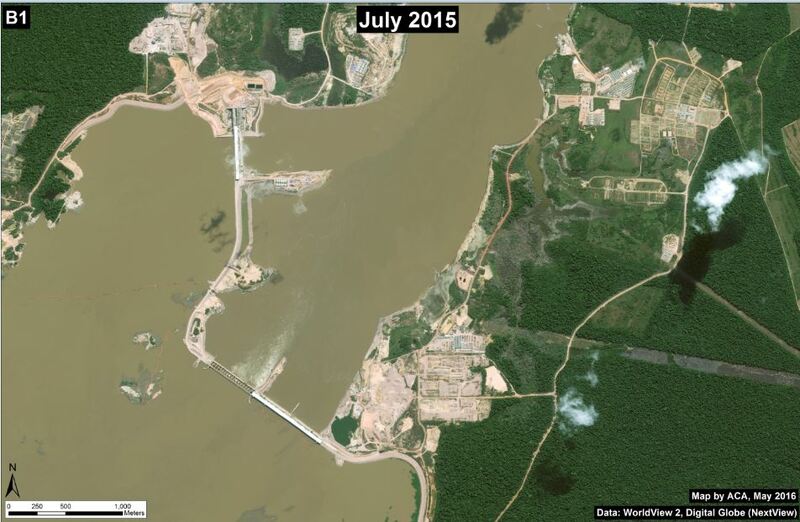 Several years ago, two dams were built across the Madeira River in western Brazil. Now researchers have found that doing so has led to the flooding of more than 36,000 hectares of forest, releasing millions of tons of greenhouse gas in the process. Researchers also worry about the dams’ impacts on migratory catfish. The Madeira is an important tributary of the Amazon River. Starting in the Peruvian Andes under the Spanish name Madre de Dios, meaning “mother of God,” the waterway crosses Bolivia into Brazil where it becomes the “wood river” in Portuguese. The Madeira then runs northeast across the states of Rondônia and Amazonas growing larger and wider until it connects to the Amazon. Along its course, the Madeira has been the target of intense human activity. Gold mining near its Peruvian Madre de Dios headwaters and surrounding tributaries has left its waters sullied with displaced sediment and mercury used to separate ore. The heavy metal has been detected in residents of downstream communities in high levels associated with neurological and developmental damage. Fish that have evolved to live in clear water are being threatened by sediment suspension from mining, which is also blocking their access to feeding and breeding grounds. Surrounding forest has been felled even in protected areas as miners illegally sift soil for flecks of precious metal, prodded by high gold prices and the difficulty of effective monitoring and enforcement in the deep jungle. The Amazon Basin has also been experiencing a recent jump in energy infrastructure development, with Brazil leading the way as it ramps up hydropower capacity in a flurry of new dams. Some 60 dams have been planned for its rivers, in a move the government is touting as a way to satiate its rising electricity demands with renewable energy while critics decry what they say are destructive environmental and social repercussions. The Jirau dam cuts across the Madeira River in western Brazil. Image courtesy of Monitoring the Andean Amazon Project. The biggest of these projects is the Belo Monte dam that punctuates the Xingu River in the state of Pará. Mired in controversy and inaugurated earlier this month by Brazil’s now-impeached president Dilma Rouseff, Belo Monte is on track to become the third-largest hydroelectric project in the world. Another of the Amazon’s major tributaries, the Tapajos River, is also the site of a series of planned dams. The project’s Environmental Impact Assessment uncovered eight mammals new to science in an area of forest that will be flooded by the construction of the dams, yet concluded the projects will have no major detrimental impacts – a claim refuted by conservationists and scientists. Social conflicts have arisen between local farmers and illegal loggers who have allegedly taken advantage of the lawlessness preceding construction of the currently stalled São Luiz do Tapajós dam by seizing famers’ land. The Madeira has not escaped this attention. Over the past five years, two dams have been built across the river in the state of Rondônia near Brazil’s border with Bolivia: the Santo Antônio in 2011 and the Jirau dam in 2013. Each is expected to have a capacity of around 3,500 Megawatts, and construction is currently ongoing. Yet, even before they are completed, conservationists and scientists say big impacts are being felt. An analysis published last week by researchers with the Monitoring the Andean Amazon Project (MAAP) found that upstream flooding caused by the dams has destroyed more than 36,100 hectares of forest – an area half the size of New York City. Data visualized on the forest monitoring platform Global Forest Watch show that much of this was part of a particularly large, connected, undisturbed tract of primary forest called an Intact Forest Landscape. Deforestation from flooding upstream from the Jirau dam. Image courtesy of MAAP. Global Forest Watch shows much of this forest loss cut into Intact Forest Landscapes. 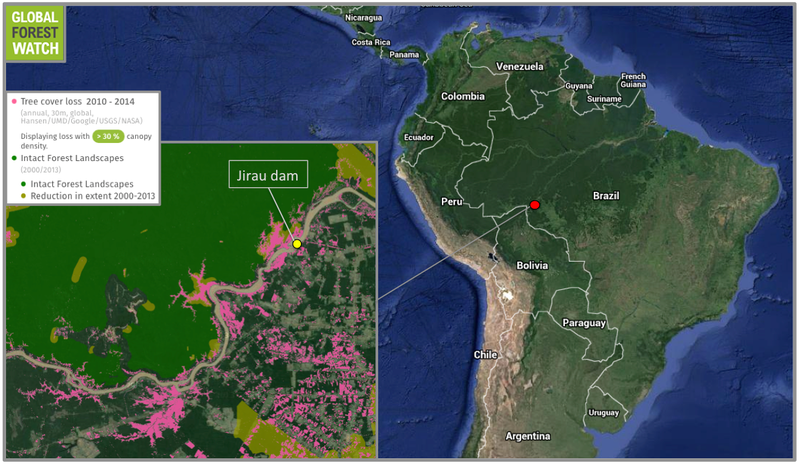 Source: Hansen/UMD/Google/USGS/NASA, accessed through Global Forest Watch. A close-up satellite image shows underwater forest near the Jirau dam. Image courtesy of MAAP. The flooded area was also once part of Mapinguari National Park. However, the Brazilian government downsized the park in 2012 in anticipation of the flooding caused by the dams. This move incited prosecutors from the Ministério Publico Federal (MPF) to file a complaint against then-President Rousseff, citing the park’s downsizing violated Brazil’s constitution and environmental laws. Lead prosecutor Monteiro Gurgel Santos also alleged that the dam projects lacked the required environmental impact studies. But Brazil’s congress subsequently decided against the MPF’s complaint and approved the government’s decision. While the areas affected by the dams are naturally regularly flooded by seasonal shifts in the Madeira, the MAAP researchers cite research that states the forest dies when permanently flooded. “Therefore, the flooded area is an appropriate measure of forest loss,” they write. And with this loss of forest comes a consequential loss of habitat for wildlife. In addition, the flooded forests were reportedly home to indigenous communities, according to Brazil’s National Indian Foundation (FUNAI) as reported by Reuters. Forests are also important when it comes to sopping up and storing CO2, with deforestation considered one of the biggest drivers of global warming. Because of this, slowing deforestation took center stage in the Paris Accord that came out of last December’s climate summit, with many nations making ambitious pledges to keep their forests in the ground. Brazil, which is responsible for nearly half of the world’s tropical deforestation emissions, announced a plan (to lukewarm reception) ahead of the summit to cut carbon emissions 43 percent by 2030 relative to 2005 levels through combatting illegal deforestation and investing in renewable energy projects. Dams function big in this plan, with a target of 45 percent of the country’s energy needs generated through renewable means — primarily through hydropower and sugarcane ethanol – up from 40 percent in 2015. But as MAAP’s analysis indicates, hydropower and deforestation can go hand-in-hand. 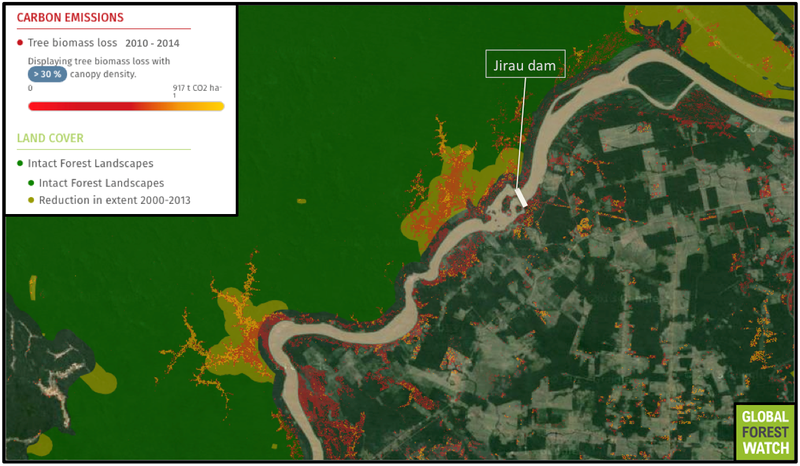 The destruction of forest immediately upstream from the Jirau dam resulted in the release of around 3.5 million metric tons of CO2 between 2010 and 2014, according to data published in Global Change Biology and visualized on Global Forest Watch. In comparison, the U.S. Environmental Protection Agency pegs the annual emissions of the average passenger vehicle at 4.75 metric tons. In other words, deforestation linked to damming of the Madeira River released more CO2 in one year than 770,000 cars on the road. Global Forest Watch shows high levels of CO2 emissions coming from areas where forest was displaced by flooding. Deforestation isn’t the only thing concerning conservationists and scientists when it comes to damming the Madeira. The waterway is a critical connection between the Amazon and the Andes, and many aquatic species migrate over its course to breed and feed. “In freshwater ecosystems, many fish species have evolved strategies to link reproductive cycles with environmental conditions to improve the likelihood of successful spawning and survival of larvae to adulthood,” write biologists Carlos Cañas and Bill Pine in a study published in 2011 in River Research and Applications. Cañas and Pine studied catfish in the Madre de Dios River (which becomes the Madeira as it flows into Brazil), and found that the fish rely on corridors created by seasonal flooding to get to their breeding grounds. Flooding may also increase the survival rate of hatchlings by helping them avoid predators and transporting them downstream, as well as dispersing nutrients through ecosystems. 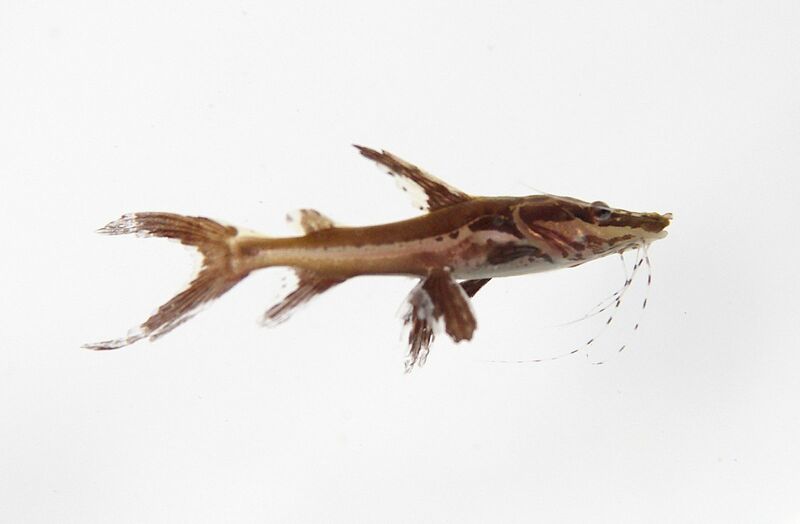 Catfish of the same genus as this juvenile Brachyplatystoma depend on connectivity in the Madeira to get to their breeding grounds. Photo by Clinton and Charles Robertson via Wikimedia Commons (CC 2.0). “These characteristics suggest that successful Amazonian catfish spawning depends on adults having access to areas with higher flooding dynamic to transport eggs and larvae to downstream floodplain rearing habitats,” the authors write. But the access that is so important for the catfish (as well as to the people and wildlife that depend on them as a food source) stands to be obstructed by dams. This, write Cañas and Pine, could have big, bad repercussions on fish communities in the Madeira and other waterways in the Madeira/Madre de Dios River Basin. In another catfish migration study published in Hydrological Processes in 2011, Cañas and coauthor Peter Waylen write that a precedent already exists, pointing to fish communities around the world that have been detrimentally affected after dams cut off or changed their migration routes. They urge this be taken into consideration when evaluating the environmental impacts of future hydroenergy projects. Canas, C. M., & Waylen, P. R. (2012). Modelling production of migratory catfish larvae (Pimelodidae) on the basis of regional hydro‐climatology features of the Madre de Dios Basin in southeastern Peru. Hydrological Processes, 26(7), 996-1007. Cañas, C. M., & Pine, W. E. (2011). Documentation of the temporal and spatial patterns of pimelodidae catfish spawning and larvae dispersion in the madre de Dios River (Peru): Insights for conservation in the Andean‐Amazon headwaters. River research and applications, 27(5), 602-611. 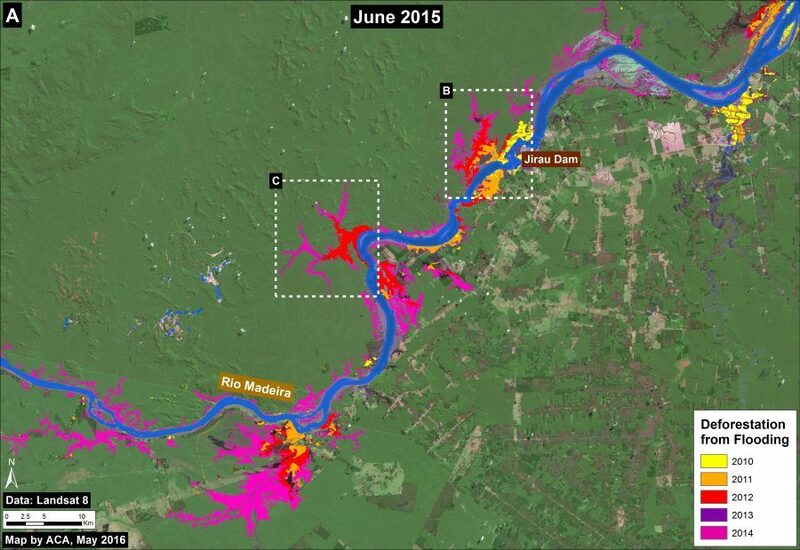 Finer M, Olexy T (2015) New Dams on the Madeira River (Brazil) Cause Forest Flooding. MAAP: 34. Zarin, D., Harris, N.L. et al. 2015. Can carbon emissions drop by 50% in five years? Global Change Biology, in press.